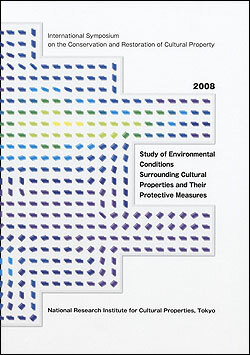 We issued a report on the 31st International Symposium on the Conservation and Restoration of Cultural Property, Study of Environmental Conditions Surrounding Cultural Properties and Their Protective Measures, which the Institute held from February 5 to 7, 2008. A wide variety of study results were summarized, including reports on case examples of damage and the methods to measure, investigate, and evaluate them, as well as environmental analyses including simulation and case examples of protective measures to conserve the mural paintings of the Lascaux Caves, the Takamatsuzuka Tumulus, and other sites. A number of activities in various foreign nations such as Italy, France, and Germany are described. The drawing up of conservation plans for mural paintings are especially valuable as case examples. We were able to transmit solid and informative study results overseas as the basis of future study exchange.